In 1985, Paul Bowles wrote this travel article about his experience in island living. Here, Bowles refers to the country of Sri Lanka, but when he owned Taprobane island from 1952 to 1956, the nation was known as Ceylon. Jane Bowles did not like the island and preferred living in Tangier, Morocco. Like most people, I have always been certain there was a place somewhere on this planet that could provide the necessary respite from all reminders of present-day chaos and noise, a place to which one could escape and, having escaped, shut the figurative door, there to breathe pure air and hear only the sounds provided by natural forces. 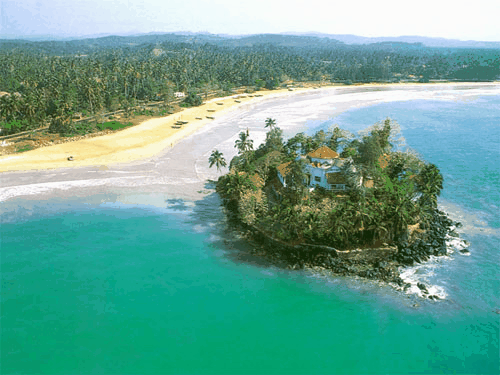 So it was with tremulous excitement that I first saw the little island of Taprobane, in Weligama Bay off the south coast of Sri Lanka. Here was a site that seemed to have all the requisite qualities: It was scarcely more than a hummock of black basalt rising above the waves of the Indian Ocean, yet was heavily covered with high trees that left visible only a glimpse of the house at its summit. I had never seen a place that looked so obviously like what I was searching for. And I felt that it was aware of me, that it silently beckoned, sending forth a wordless message that meant: Come. You’ll like it here. Paul Bowles' former island, as it looks today. Three years later, I signed the necessary documents and became the owner of this tiny parcel of paradise. The erstwhile proprietor, a rubber planter named Mr. Jinadasa, also bred racehorses and bet on them. When a horse in which he has great confidence failed to justify his hopes, he found himself in immediate need of cash. My informant in Sri Lanka wired me in Madrid, and as soon as the news arrived I rushed out to cable the money. I inherited a couple who were resident gardener and maid, and who continued their work as if they were still in the employ of Mr. Jinadasa. In aspects they had worked for several owners, scarcely knowing them apart, and were aware only that their employer must be addressed as Master. The island had belonged to various people in the recent past, and none of them had kept in very long. It was a pleasure dome, a place they used for weekend parties. The only person who had actually lived there was the Comte de Mauny Talvande, who had built the house and furnished it after reclaiming the island from its former status as the local cobra-dump. (All cobras found in the region were put into sacks, carried across to the island and left there, since in Sri Lanka one doesn’t kill snakes). In order to settle in, I needed to buy only new mattresses for the beds, and lamps and kitchenware. The furniture, made of the heaviest kinds of tropical wood, was well-nigh immovable. Finding a good cook was the greatest initial challenge, but eventually, in the nearby town of Matara, I unearthed a man who had been chef in a hotel. At the same time I discovered that no cook would work without an assistant, so I was obliged to take on two men. The cook cooked; the extra man served at table and washed dishes. Indeed, each employee in the house had a very precise idea of what his work involved, and it was impossible to get any of them to perform an act he considered to be outside his domain. The maid polished the furniture and filled bowls with orchids. The gardener fetched things from the market in the village on the mainland. Another man, a Hindu came twice a day to empty the latrines, as there was no running water on the island. Life moved like clockwork; there were no complications. For me, much of the joy of living on Taprobane had to do with lying in bed at night listening to the sound of the big waves booming against the cliffs below, and the more distant, subdued sound of the same waves breaking on the sand along the great curved beach. I couldn’t conceive of a greater luxury then, nor can I now. The subsidiary luxuries consisted of early tea along with an assortment of fruit (served in bed), a real English breakfast at nine and, at midday, a curry the like of which I’ve not eaten elsewhere. The cook provided twenty side dishes for each meal (including marunga leaves which, sprinkled over coconut cream, gave the food an irresistible flavor). At night the men would go down to the rocks and catch enough lobsters for the next day’s curry. When the lobsters were too few, we made do with spearfish, the local equivalent of pompano, and equally delectable. Only once was this tranquil existence significantly disrupted: What happened was that the government of Sri Lanka came to an agreement with Peking whereby China would receive the totality of Sri Lanka’s rubber crop in return for specified quantities of China’s rice. The rice arrived, but it had been lying in damp warehouses for so long that it was rancid. When one tried to cook it, it gave off an unbelievably powerful stench; it was inedible. All the Sinhalese were complaining, but there was no help for it. The only solution was to comb the shops in all towns along the coast for boxes of English rice and hoard them and, when the shops were empty, which they soon were, to go more than a hundred miles to Colombo and bring back all one could find. Only thanks to such efforts did the curry continue to be as good as ever. For the most part, however, life on Taprobane was trouble-free: The ocean was languorously warm, and the sharks left alone. You could see them a few hundred feet away as they patrolled the reef, but they never ventured inside. Occasionally a gigantic tortoise that lived among the rocks on the southwest side of the island would rise to the surface and remain there, a floating boulder. If one swam toward it, it quickly submerged. “Old,” Benedict the gardener told me one day, indicating its domed back. The catamarans bearing fishermen streamed past the island before sunrise and returned en masse at sunset, oars and sail giving them speed. And just as regularly, each daybreak flocks of crows arrived to chase away the hordes of bats that spent each night hanging from the trees outside the windows. The bats were surprisingly big, often with a wingspread of three feet. Their bodies were covered with dark, russet-colored hair and their teeth looked very sharp when you flashed a light into a tree and saw them hanging above you. They were fruit eating animals and entirely innocuous, even with respect to the vegetation; the big trees on the mainland where they gathered in day time were burned white by their dung, and nothing grew in the immediate vicinity, but for some reason they did not excrete at night. It was the crows that saved my trees. They came in great numbers at dawn for no purpose that I could discern other than to drive away the bats. Once they had done that and remarked about it with each other for a while, they flew back to the mainland. But the bats never returned until dark. The central room of the house was 30 feet high, with a cupola at the top that let the wind blow in from all sides, so that even though the air was hot there was always a breeze moving through the room. The voluptuous breeze and the sounds of the sea made an after-lunch siestas inevitable. I missed two or three hours of the afternoon, but how fine it was when the cook’s assistant arrived from behind the curtains at five o’clock saying, “tea, Master,” and put the tray down on the bed, and I drank the tea still listening to the pounding waves. Then it was time for a late afternoon dip in the sea, when Benedict would return with provisions from the village along with two men who waded through the waves carrying tanks of water on their heads. Benedict did not like to be out after dark. Although he claimed to be a Catholic, he shared some of the superstitious of the uneducated Buddhist coastal population. He was particularly afraid of meeting a black dog on the road. According to him, all black dogs were evil spirits and should be avoided. I knew that the island had been cleared of snakes several decades earlier, and I had never seen a sign of the presence of venomous spiders or scorpions. Nevertheless, one evening the cook on his way to the kitchen stepped barefoot on a large centipede. He cried out, dropped the tray he was carrying and fell to the floor unconscious. Benedict, having been called from below, came with a “cobra stone,” made an incision in the foot and rubbed the stone over it for some minutes. When the cook had revived, I asked to see the stone, but Benedict did not want me to touch it. In his hand it looked something like a sponge, light and porous. This miniature drama became in retrospect a major event, so uneventful was the passage of the days and weeks. Time moved swiftly, imperceptively, on the island. Had it not been for two things, unrelated but equally important, I could have prolonged my sojourn there indefinitely. The first was that at the end of June the southwest monsoons arrived, so that during the high seas of the summer months Taprobane was uninhabitable. The other was the Sri Lankan law required every foreigner who remained in the country six months or more to pay a high tax on his global income. Since I generally went to Taprobane around Christmas, I had to arrange my return to Europe for mid-June. Taprobane was not a permanent escape, then, but for half of each year it was idyllic. Of course, no idyll is without its irony: When I finally did sell the island, the proceeds were impounded by the Finance Control of Sri Lanka, so that I have never seen any of my money. One can’t always win—but one can always remember. Read a related travel article by Paul Bowles entitled "How to Live on a Part-Time Island", written and first published in 1957.